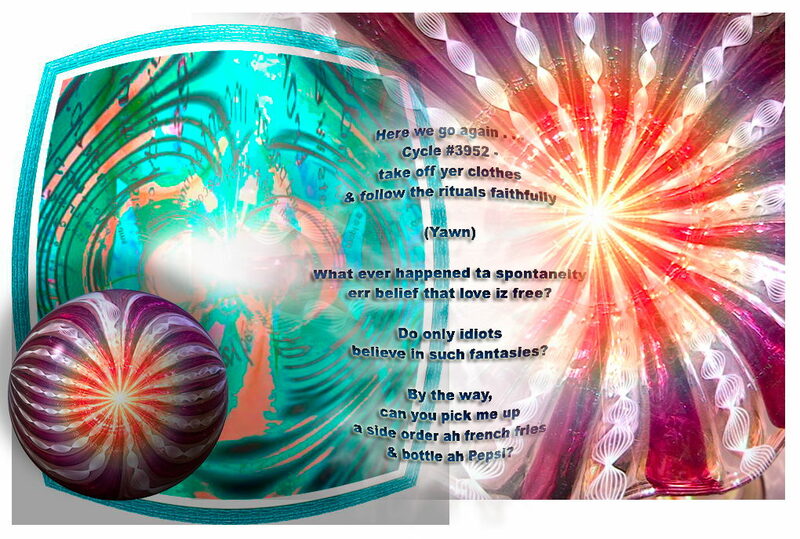 Cycles of Desire - an art work, poem, and near dialog by T Newfields"
If someone yawns during a love poem, what does that say? Terry: I dunno, but what most people call "love" is merely a choreographed performance. Miok: Yeah, & ritualized routines soon get stale. Yawh guys think too much. Hey & relax & have a Pepsi! Tim: [waking up from sleep] Did some mention drinks? Copyright (c) 2002, 2012 by T Newfields. All rights reserved.